Women's Boots | Designer Dress Boots, Winter and Western Boots | WomensBootShop.com. Women's Dress Boots, Winter, Western, Work Boots and more for sale online from top name brands and footwear designers. Women's side-zip knee-high boots available in BLACK, BROWN, or GRAY. Constructed from smooth faux suede, this pair flaunts stunning floral patterned-embroidery along the side and on its block heel. Available in your choice of BLACK or PINK. 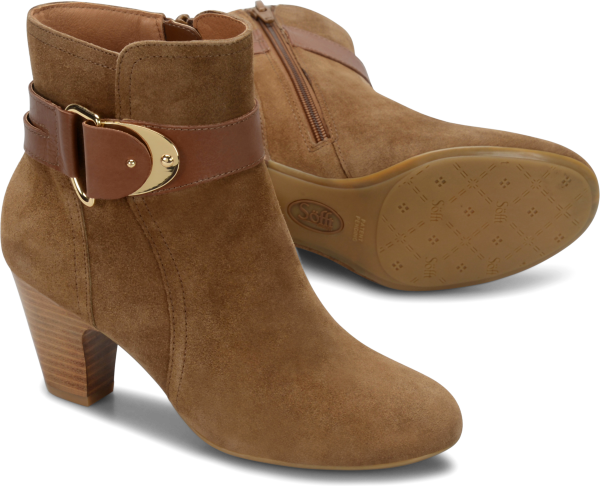 Side zip booties with 2 inch stacked heel. Available in TAN or BLACK. Stylish design in waterproof leather has a real sheepskin lining. Hidden side zip. Stacked heel. Lug sole. Available in BROWN or DARK BOXWOOD. Available in BLACK or BROWN SUEDE. Your choice of standard or enhanced metatarsal arch support footbed! Tall suede boots continue to reign this season with impeccable style and versatility for all occasions — from an afternoon of shopping to a cozy dinner with friends. Available in BLACK or TAUPE suede. Choose from brand list at left to view all boot styles available.